“The action of repairing something” or “the making of amends for a wrong one has done, by helping those who’ve been wronged” – two definitions of the word, “Reparation”, which is also the title of a psychological thriller that’s been working the festival circuit since last year. The film has won eleven awards so far and is based on The Activist, a play written by Steve Timm, who co-wrote this screenplay with first-time director Kyle Ham. Now getting limited theatrical release, the film is a confident, low-budget mystery that includes elements that already intrigued me – head trauma and military PTSD – and unfolds in quite a gripping and fascinating manner. Something has happened to Bob Stevens (Marc Menchaca “Generation Kill” and “Homeland”), but he can’t remember what. The last three years of his life are a blur – in fact, they are literally gone from his mind. As he’s released from a VA Hospital after serving in the Air Force, Bob is asked by an official who it is he talks to. That’s another thing about Bob, just about the only person he interacts with is his imaginary friend – a young boy named Ralph (Brody Behr, in a strong acting debut), that no one else but Bob sees. He’s advised to go to Indiana for follow-up treatment, but instead remains in California and finds work at a roadside nursery, where he sells fruits and vegetables. Bob remains quiet and introverted and is able to function on his own, despite the crippling headaches that are unpredictably triggered. One such attack occurs as Bob walks home from work after seeing a police squad car drive past him, leaving him lying on the side of the road. He is found by the fiery redhead he saw back at work, who stops to give the disoriented Bob a lift. Her name is Lucy (Virginia Newcomb) and although Bob is caught off guard by her forward directness, the two hit it off and soon have a child together. They move into Bob’s grandparent’s old home, where Bob’s local deputy brother, Marty (Adam Philpott) used to reside. Bob still stares off into the distance and occasionally talks to his imaginary friend, but having both Lucy and their daughter, Charlotte (also another solid acting debut from Dale Dye Thomas) in his life provides the haunted man with some needed balance. 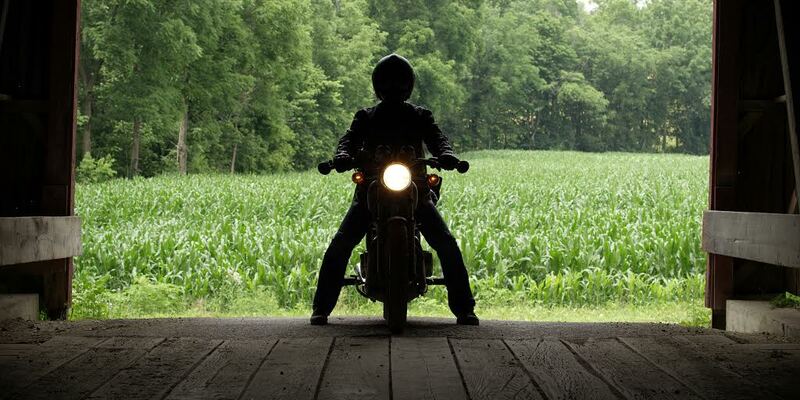 That peaceful balance is shaken when a mysterious visitor comes to town on a motorcycle. He tells Bob he’s an old Air Force buddy of his, yet his name, Jerome Heller (Jon Huertas, “Castle” and “Generation Kill”) doesn’t ring a bell. Bob apologizes and informs Jerome he suffers from dissociative disorders, which finds him often “drawing blanks” as to what transpired within the past three years. Jerome doesn’t buy it, implying its a hoax and stating he wants his old friend back. When Bob reiterates his condition to Jerome, the stranger becomes irritated. To make amends, Bob invites Jerome over for dinner, where he meets Lucy and Charlotte for the first time. The occasion takes an odd turn, when Charlotte utters Jerome’s name out loud after she shakes his hand during an introduction. Both are startled, especially Charlotte, who runs off upon seeing a disturbing mental image immediately after the introduction. That’s only the beginning though. Soon, Charlotte experiences nightmares with similar chilling images, which compels her to draw out what she sees in these dreams and her parents are concerned when the drawings are graphic and quite horrifying images of violence or death. It slowly becomes clear to Bob that these images his daughter is drawing are from his own past, when he was serving as an Air Force cop with Jerome. With each drawing, he starts to piece together the jigsaw puzzle of his past. At this point, Jerome is determined that something is up and his once-friend is somehow leading him on with his memory loss claim. How else would Charlotte know his name? Feeling bad that Jerome is supposedly down and out, Bob gives him work managing the farmstand he runs, but the more Jerome hangs out around town and near Bob’s family, the more uneasy Lucy feels about this mysterious “friend” from her husband’s past. As Charlotte’s drawings become more intense, more of Bob’s past surfaces, causing more unexpected questions about his past with Jerome. What are Jerome’s true intentions? Why is Charlotte envisioning her father’s past? Who is this boy Bob imagines and interacts with? Not all of those questions are answered and that’s okay, since the overall story that unfolds in “Reparation” is quite satisfying. There are even more questions that develop after those answers are given, but the majority of the storytelling from Steve Timm and Kyle Ham had my attention from start to finish, nevertheless. 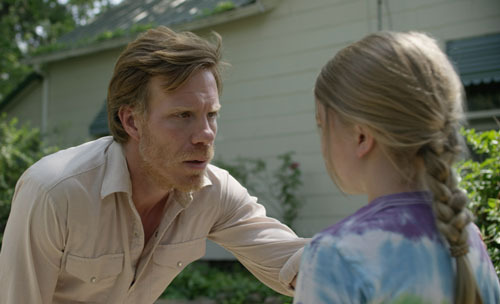 For a feature directorial debut, Ham and his cinematographer Jay Silver (“The Last Rites of Joe May”) deftly handle the back and forth of the present to certain memories that begin to come back to Bob as well as the legitimate twists that are revealed in the film’s compelling third act. The two main characters in “Reparation”, played by Menchaca and Huertas, have key roles in making the film convincing and engaging and both actors deliver fine work here. As Bob, Menchaca really conveys the disorientation and awkwardness of maneuvering a new self, while dealing with shards of his past that come back to haunt him. Huertas roles is just as challenging, since he has to play a character the audience has to figure out, while keeping Jerome’s past activities and present intentions close to the vest. The character of Jerome could’ve easily been depicted as more of a black-and-white antagonist, but Huertas left me wondering where he was going to go with the character at each turn. Both actors essentially have to play two versions of their characters, the present Bob and Jerome and the ones we meet in the past during the flashback scenes where more is revealed about each of them. There is another antagonist (or instigator) who pops up primarily in flashbacks and that is Col. Atreus, played by Oak Park, Illinois native Keith Szarabajka (“The Dark Knight” and “Argo”) a reliable character actor who lends gravitas to an important role. He’s a character that provides more revelation to Bob and Jerome’s past in the Air Force and Szarabajka does a very convincing job conveying a forceful presence to the story. The actors who played Lucy, Charlotte and Ralph are brand new to me and I found myself impressed with their committed and lived-in work. As Lucy, Newcomb reminded me of the kind of strong-willed characters Amy Adams often plays and even recalling the vulnerability seen in young Sissy Spacek. She solidifies Lucy as a fully-realized character all her own, without the reliance of her role as a lover to Bob and mother to Charlotte. In their acting debut, the kids who play Charlotte and Ralph comfortably hold their own with their adult costars, portraying two characters that are vital to the mystery of the story. While it helps that the screenplay didn’t write them into cliché child roles, it’s a credit to Thomas and Behr that they’ve created memorable characters. The issues I have with “Reparation” are few and although they never really took me out of the story, they still lingered in my mind. One of them is Charlotte’s abilities. It could’ve been explained as a genetic thing or some supernatural talent, but Timm and Ham chose not to explain how she’s able to do what she does – which is fine, since I don’t need everything explained to me – but, when you have characters in the film struggling to pinpoint the Charlotte’s ability, yet not come up with an explanation, there is a bit of an unresolved element to the story. The other thing I noticed is how Indiana is mentioned at the beginning of the movie, yet it seems like the entire story takes place in California. It clearly doesn’t. The problem is the setting is clearly the Midwest and not the west coast – in fact, the entire film was shot in Putnam County, Indiana – which left me wondering why the whole story wasn’t just set in Indiana. These are small quibbles, for a film that was ultimately a satisfying look at identity, loyalty, friendship and grief. If Timm and Ham continue to work together, I’m on board and looking forward to any of their future collaborations – and so should you. SPECIAL NOTE: There will be a special presentation of “Reparation” on Saturday, September 10th at the Wilmette Theatre in Wilmette, Illinois, a north suburb of Chicago. After the 7pm screening of the film, there will be a Q&A panel with actors Keith Szarabajka and Brody Behr, cinematographer Jay Silver as well as Steve Timm (writer/producer) and Kyle Ham (editor/writer/producer/director). More details here.